Have You Heard about the FUN? Give Your Guests the Experience! These days, photo booths are all the rage at weddings and special events. Mugging for the camera is as sweet as cake, and fun for all ages. Now, as a part of our wedding DJ service, AllPro DJs can include a Photo Booth. Best of all, no worries about fly-by-night photo booth companies - we assure your satisfaction with the same professional attention we've brought to generations of customers throughout the Pittsburgh region! Your guests appreciate photo strips as a personalized keepsake. 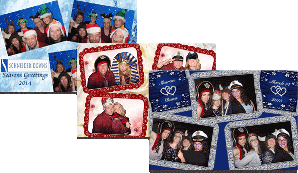 Photo strips with "customized message" for your event. No cost to your guests - all photos are a part of the photo booth package you choose. Unlimited photos during photo booth rental. Color and B&W photos, chosen by the guest for each photo strip. Fully automatic with high-quality prints. Learn more about our Photo Booth Options. For more information, please Contact Us today. A Pittsburgh Wedding DJ is here for you! Print Choices... Cards or Strips? Photo Strips are what made photo booths popular, but now you have many choices of styles for your prints. You may like the new popular 4x6 Photo Cards that are custom designed to your special event. Click below for samples of both! Your guests will have a blast. Why wait? Contact the Pittsburgh DJ professionals today! Save by Adding a Photo Booth to Your Wedding Video Package or DJ Service. Because we are the Pittsburgh area's premiere DJ service, we can offer the fun of a photo booth service for less than most independent photo booth rentals. Inquire about adding a photo booth to your wedding or event DJ service and save! Also available at a discount when hiring our Wedding Videography services. Learn more about our Photo Booth Options. For more information, please Contact Us today. AllProUSA Multimedia is here for you! 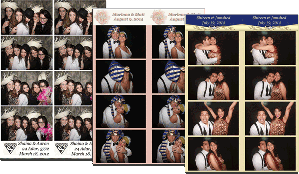 To help make your wedding reception the best that it can be, download our Photo Booth Planner.